Published: Mar 5, 2018 · Modified: Apr 11, 2019 · By Jen Sobjack · This post may contain affiliate links. Baked Bunuelos with Anise Filling are a fun spin on the traditional bunuelos found all throughout Spain and Latin America. 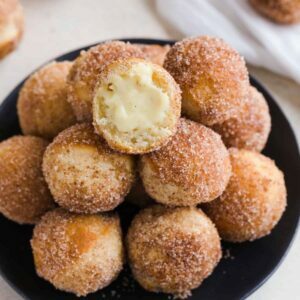 They consist of balls of dough that are baked instead of fried then filled with anise custard and rolled in cinnamon sugar. If you’re like me then you love trying new things, especially when it comes to food. I’ve made it a personal goal this year to experiment with ethnic spices. That’s what inspired today’s recipe. 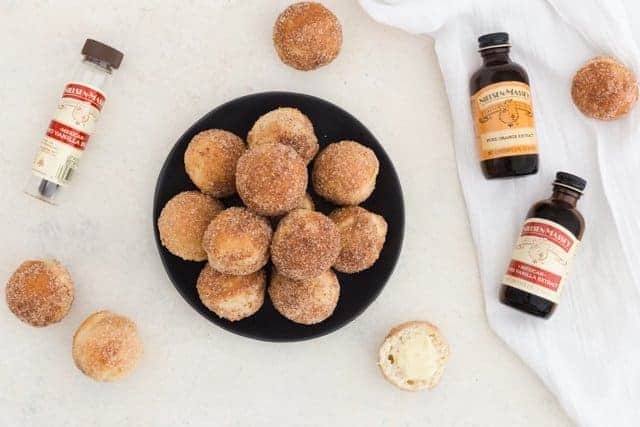 Well, that and some fun food trends for 2018 – like unusual donut fillings! Have you ever had bunuelos before? They are a simple dough, most often wheat, that is fried in either a ball or flat disc shape. You can find them all across Spain and Latin America. And each country has its own way of making them. 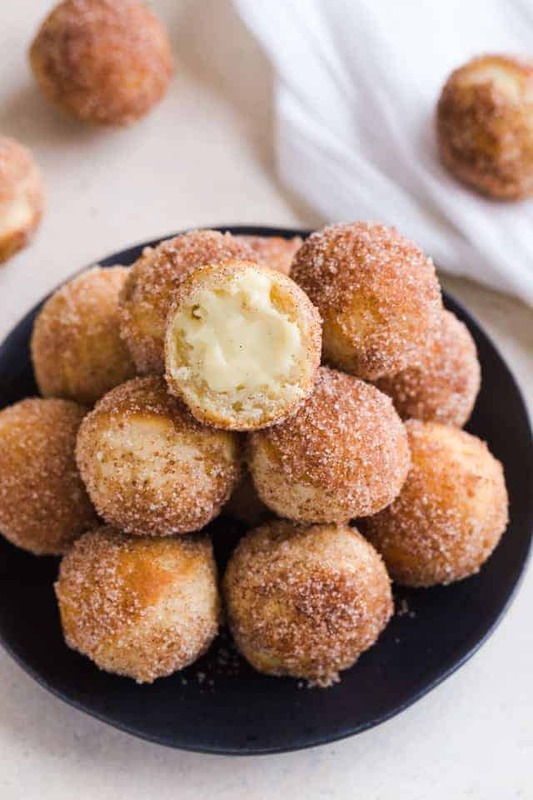 I’m putting my own spin on bunuelos by making a baked version, filled with an anise custard, and rolled in cinnamon sugar. All the flavors work well together and the cinnamon sugar complements the filling nicely. How do you make baked bunuelos? Let’s start by talking about the batter. 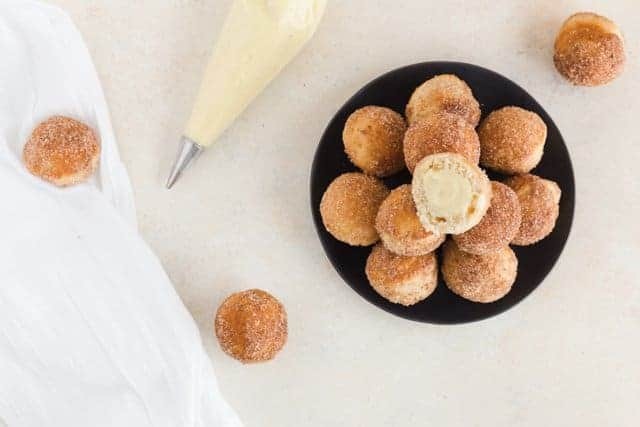 It’s super simple and calls for fairly basic ingredients – milk, egg, Mexican vanilla extract, flour, sugar, baking powder, salt, and melted butter. For the Mexican vanilla, I chose to use Nielsen-Massey Mexican Pure Vanilla Extract. Remember, I’m experimenting with ethnic spices so this was an obvious choice. The vanilla is sweet and creamy with a deep, spicy character. Have you tried Nielsen-Massey products before? The company is family owned and managed and they produce premier pure vanilla and flavor extracts. 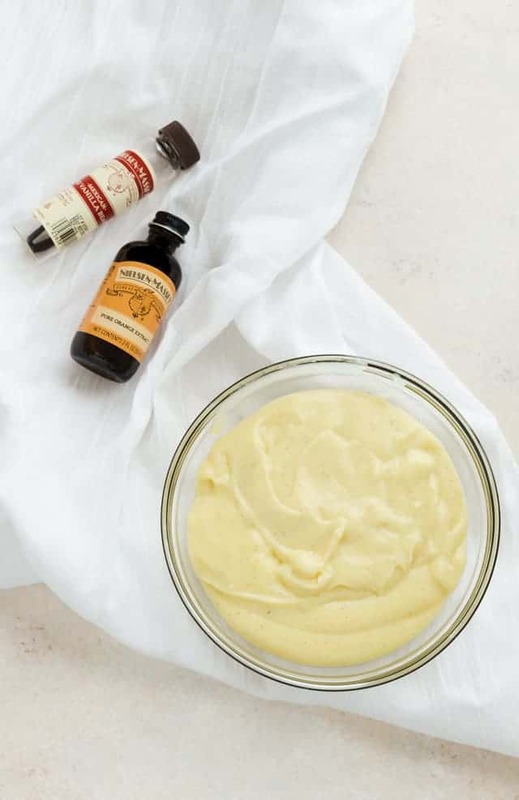 They understand that vanilla tastes best when its natural essence is allowed to shine so they use as few ingredients as possible when processing their pure vanilla extracts. They truly offer the highest-quality products available. I just love them and use them all the time in my baking. Remember these cranberry orange sweet rolls? They’re SO GOOD! 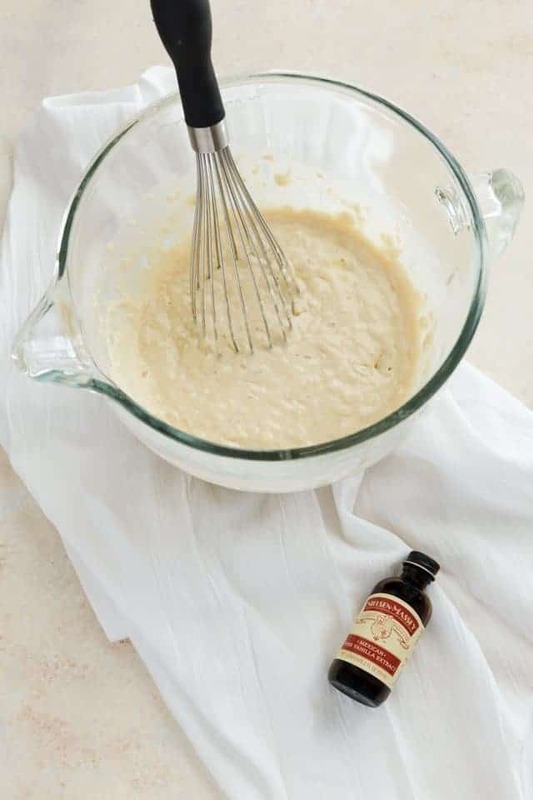 To make the batter, mix together the wet ingredients then mix the dry ingredients and combine the two. You need just two bowls and a whisk. It’s so easy! 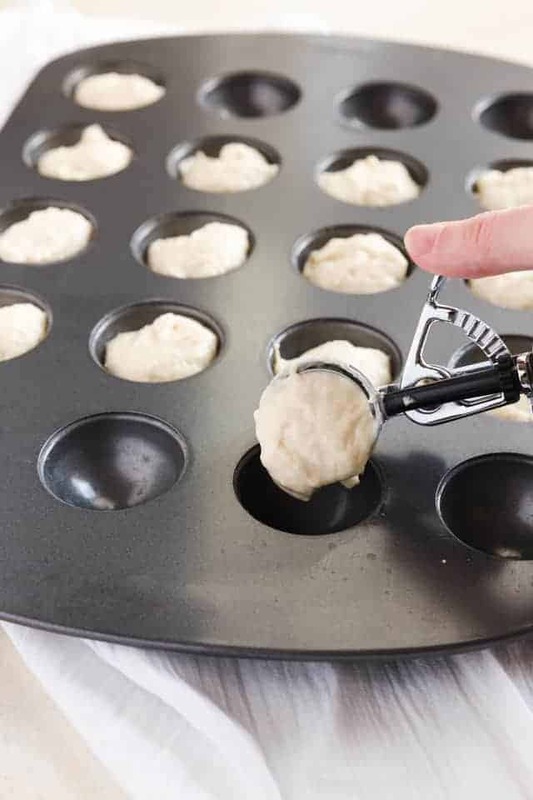 You do need a donut hole pan for this recipe but a mini muffin pan will also work. Fill the cavities with one tablespoon of batter and bake them. After the bunuelos finish baking, I like to broil the tops for a second or two to make them look evenly brown. The anise filling is definitely an interesting one that highlights this ethnic spice that’s native to the eastern Mediterranean region and Southwest Asia. The flavor profile of anise seed is similar to star anise, fennel, and licorice. Some people love it while others don’t really care for it. Make the filling just like you would make a custard. Bring the anise seed, the seeds of a Nielsen-Massey Mexican Vanilla Bean, and milk to a simmer. Don’t let it boil or the milk will curdle. The eggs need to be tempered before they are added to the hot milk. Do this by whisking them with sugar, cornstarch, and Nielsen-Massey Pure Orange Extract until smooth. Slowly pour half the warm milk into the bowl with the eggs while you whisk continuously. Then, pour the egg mixture into the pot with the remaining milk. Cook the custard while continuously stirring until it thickens. It will thicken quite fast because of the cornstarch. Remove it from the heat as soon as it reaches a pudding-like consistency. Press the anise custard through a fine-mesh sieve to remove the seeds and any bits of egg that may have scrambled. Cover it with plastic wrap touching its surface so a skin doesn’t form and refrigerate it for at least two hours or up to four days. Since the filling requires chilling time, I suggest making it first then make the bunuelos. Once the bunuelos are cool enough fill, the custard should be set. How to fill baked bunuelos? Filling the bunuelos is also simple but it can be tedious. First, use a skewer to poke a hole and make a cavity inside the bunuelo. Transfer the filling to a piping bag fitted with a small piping tip. If you don’t have a small one, it’s okay. Just cut the tip of the piping bag and insert it into the cavity of the bunuelo. Gently squeeze the filling inside until no more will fit in. You may have some filling left over depending on how big you make the cavity. You can save the filling and make more bunuelos or use it as a dip for the bunuelos you have. My husband did this because he said there wasn’t enough filling inside, hahaha! 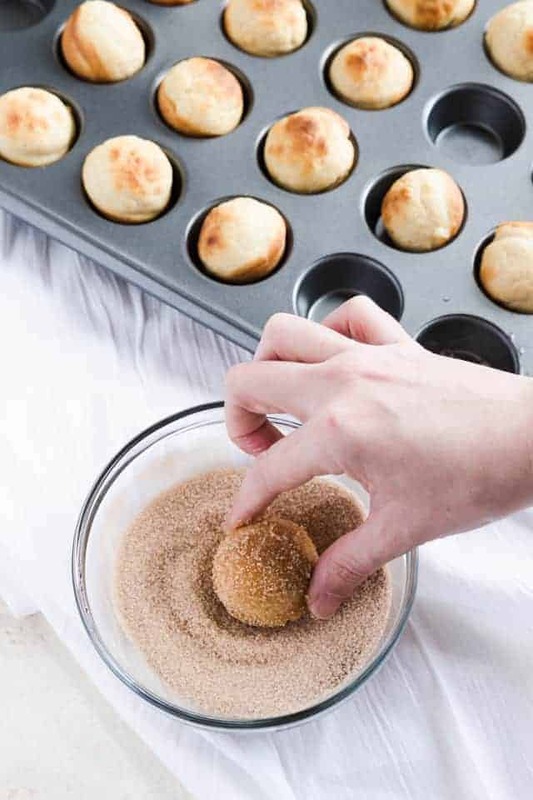 After you fill the bunuelos, brush them with melted butter and roll them in cinnamon sugar. This ties all the flavors together and makes one epic dessert. 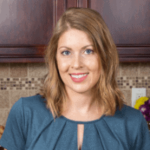 Look for Nielsen-Massey products when shopping for this recipe. They are all-natural, certified gluten-free, certified Kosher, allergen-free, and GMO-free. Scrape the seeds from the vanilla bean. 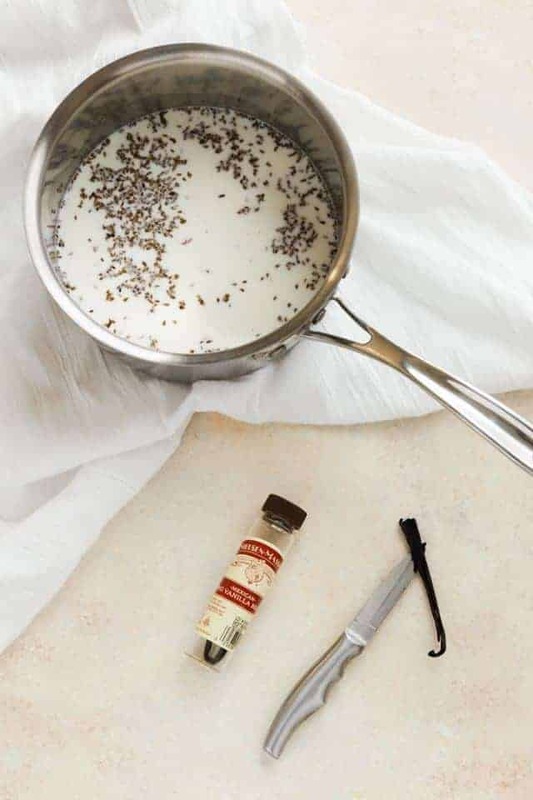 Combine the seeds, anise seed, and milk in a medium saucepan. Bring to a simmer over medium heat. Add the orange extract. In a medium bowl, whisk the sugar, cornstarch, egg, and egg yolks together until smooth. Slowly pour half the milk into the egg mixture while whisking continuously. Pour the egg mixture back into the saucepan with the remaining milk. Cook over medium heat while stirring continuously. When the custard comes to a boil and thickens, remove it from the heat. Press it through a fine-mesh sieve into a bowl and cover with plastic wrap touching its surface so a film doesn’t form. Refrigerate for at least 2 hours and up to 4 days. Preheat the oven to 350°F. 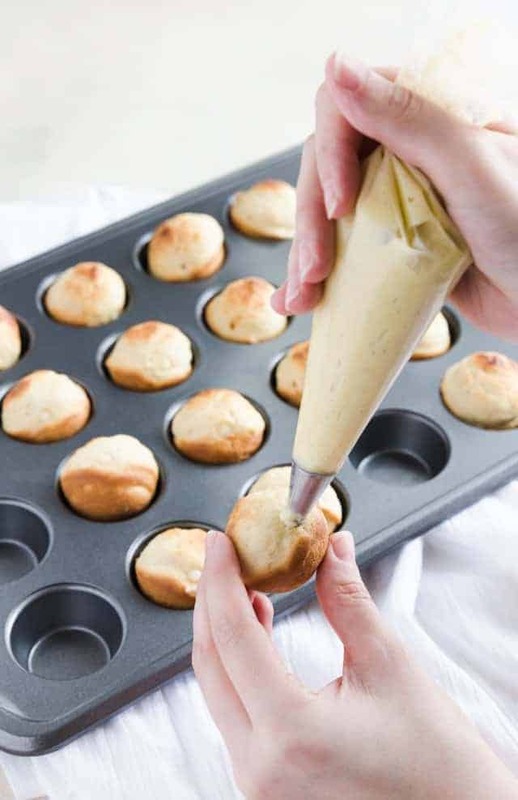 Spray a donut hole pan or mini muffin pan with nonstick spray; set aside. In a separate medium bowl, whisk together the flour, sugar, baking powder and salt. Stir the milk mixture into the flour. Stir in the melted butter, mixing until combined. Bake for 15-17 minutes or until a toothpick inserted into the center comes out clean. Remove the bunuelos from the oven. Transfer the bunuelos to a wire rack to cool completely. Use a wooden skewer to poke a hole in the side of the bunuelos, pressing about halfway through and wiggling gently to create a cavity inside. Transfer the filling to a piping bag fitted with a small round tip and gently insert the tip into the cavity and squeeze a little filling inside each bunuelo. Place the melted butter in a small bowl and set aside. In a separate bowl, mix together the granulated sugar and cinnamon until well combined. 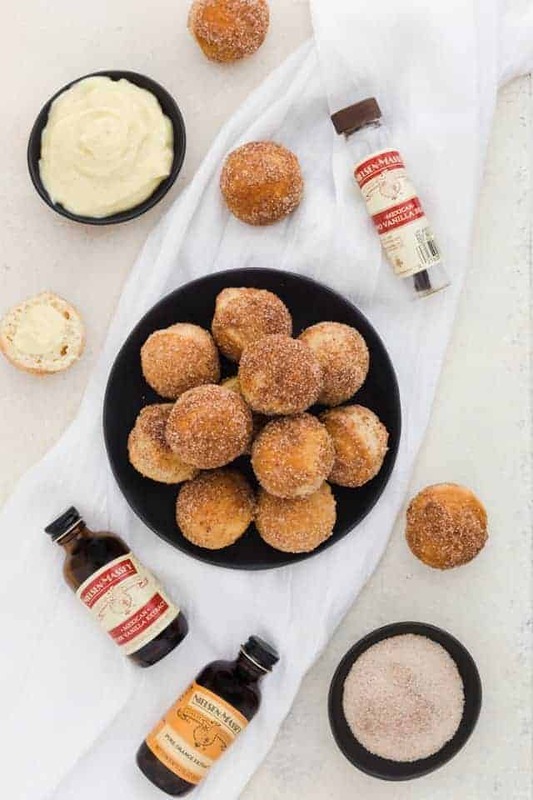 Take each bunuelo and dunk it into the melted butter, making sure it is fully coated. Then dip it into the cinnamon and sugar mixture, making sure to coat well. You may have some filling left over depending on how big you make the cavity. You can save the filling and make more bunuelos or use it as a dip for the bunuelos you have. This is sounds so interesting. I’ve never heard of bunuelos but they sure look good!